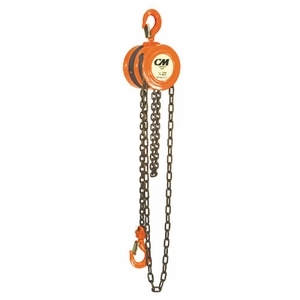 Get everything you need, and pay for nothing more, that's the premise with the CM 622 hand chain hoist. Simple, efficient, economical design that will serve you well. 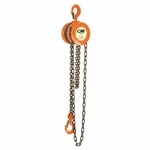 These hoists are equipped with hardened load chain for flexibility and long wear. They feature a compact design, low headroom and lightweight steel construction for easy installation, even in confined spaces. A Weston-type load brake requires no lubrication. The hand wheel cover with guide slots minimizes jamming and slipping. Forged swivel hooks with latches reduce twisting of chain and unintentional unhooking of load when chain is slack. Metric rated.